Roy David McMillan was born on July 17, 1929 in Bonham, Texas. The five foot eleven right handed hitting short stop, was originally signed by the Cincinnati Reds in 1947. After four years in the minors he made his MLB debut briefly in 1951. McMillan played every game from the 1952 season through the 1954 season, leading the league in games played twice. He became one of the best shorts stops in the league, winning the first gold glove given out at short stop in 1957. He won two more the next two seasons. In 1954 he set a record at the time, turning 129 double plays at short stop. He would go on to lead the league in games played at short as well as in fielding percentage six times each. He led in assists four times, put outs three times and played in two All Star games. McMillan was so good at short he was considered in the MVP voting five times. He was typical for shortstops of his era, great glove without much hitting. From 1955 through 1957 he posted on base percentages over .360 % each year., while drawing over 66 walks each year. In 1957 he hit a career high 25 doubles posting a .317 on base percentage. After spending ten years in Cincinnati he was traded to the Milwaukee Braves for Juan Pizzaro in 1961. In Milwaukee he hit a career high 12 HRs in 1962 and continued playing some of the best short stop in the league. 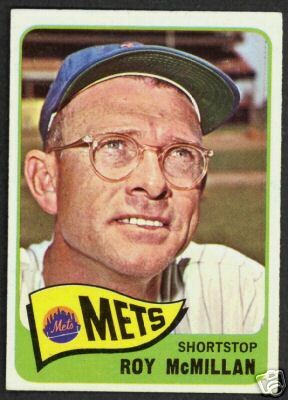 In May 1964, he was traded to the New York Mets in exchange for Jay Hook and a player to be named later. That player turned out to be Wayne Garrett's brother; Adrian Garrett. 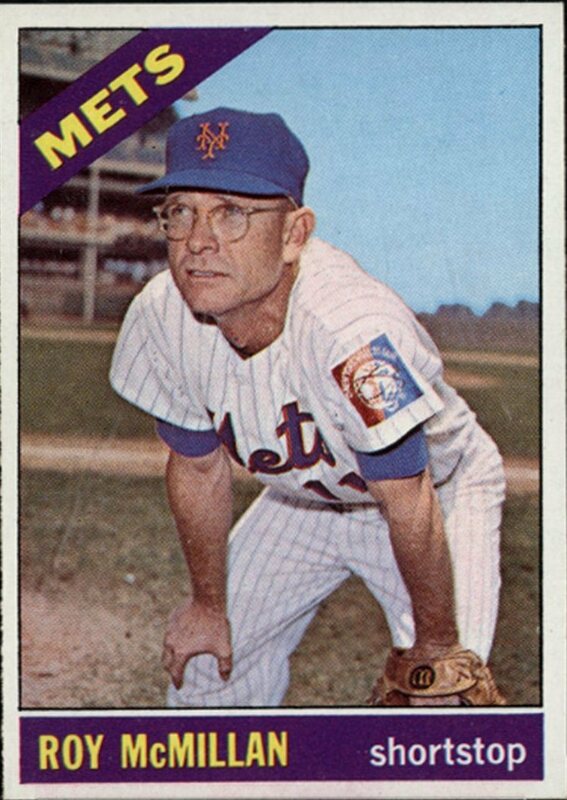 McMillan played in 113 games at short stop the rest of the way for the '64 Mets. He turned 64 double plays posting a .976 fielding % (second best in the NL). 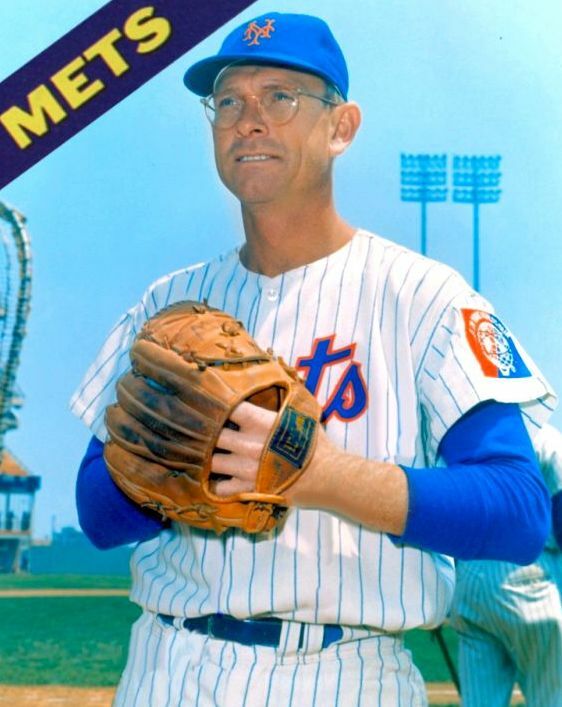 McMillan debuted as a Met on May 9th in a game against the St. Louis Cardinals at home. 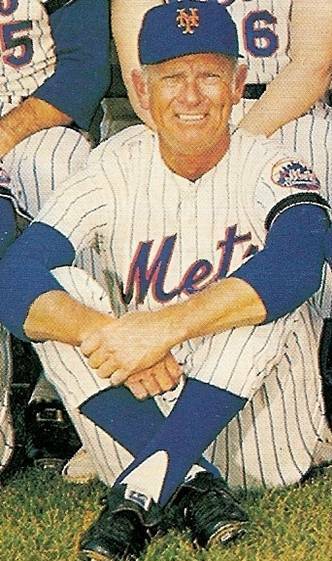 In his second game he tripled & doubled off former Met Roger Craig, scoring a run as well in the Mets 4-1 win. On September 7th in the first game of a double header at Shea Stadium, McMillan hit a rare two run HR off Houston's Claude Raymond. He later added another RBI leading the Mets to a 7-5 victory. On the season for New York he hit .211 with 8 doubles two triples one HR 25 RBIs & a .246 on base %. In 1965 he led the team in games played (157), at bats (528) & sacrifice hits with 16 (third in the NL) while batting .242. At short stop he was second in assists (477) third in put outs (248) & second in errors (27) posting a .964 fielding % while turning 80 double plays. 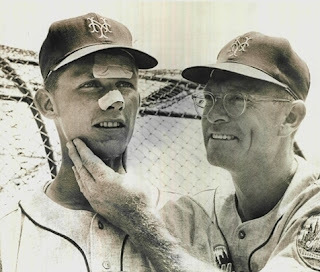 On April 20th his sac bunt scored a run in a scoreless game against the Los Angeles Dodgers, the Mets went on to win the game 3-2. On May 4th McMillan singled to score Ron Swoboda with the tying run in the 7th inning of game against the Philadelphia Phillies. The Mets went on to win it 2-1. On May 16th he hit a HR in the first game of a double header against his old Reds team mates. On June 20th he singled driving in the first two runs of a 3-2 Mets win in the second game of a double header at Dodger Stadium. He closed out June driving in runs in three of the last four games of the month. From August 16th through August 28th the weak hitting short stop drove in eight runs, while enjoying a hit streak of 15 of 18 games. McMillan played in 157 games batting .242 with 19 doubles two triples, one HR 42 RBIs & a .280 on base %. On May 29th 1966 McMillan who always seemed to do well against the Dodgers, had a game winning hit in the top of the 9th inning. His single off star reliever Ron Perranoski scored Hawk Taylor in what was the games winning run. He hit his last career HR on July 20th, 1966 off Giant's Hall of Famer, Juan Marichal in San Francisco. It came in the top of the 8th inning breaking a 1-1 tie. The Mets went on to win it with Ron Swoboda's 10th inning HR. He finished his playing career with the Mets in early August 1966 playing 76 games batting .214 with one HR nine doubles one triple & 12 RBIs. 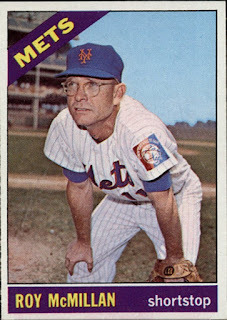 McMillan served a huge role in developing the career of Bud Harrelson, serving as his mentor at shortstop. Harrelson learned a lot from McMillan on his way to becoming one of the best shortstops of his generation. 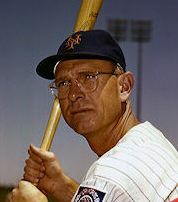 McMillan finished his career with over 2000 games at shortstop, and at the time of his retirement was only one of four shortstops to do so. In a 16 year career he played 2028 games at short stop (18th all time) with 6191 assists (16th all time) 3705 put outs (19th all time). In over 6191 attempts he made only 290 errors (74th all time), turning 1304 double plays as a short stop (8th all time) while posting a .972 fielding percentage (68th all time). He was a lifetime .243 hitter with 1639 hits 253 doubles 35 triples 68 HRs a .314 on base % 140 sac hits & 665 walks. Honors: Roy McMillan was inducted to the Cincinnati Reds Hall of Fame in 1971. After his playing days, McMillan managed the Visalia Mets in 1968 & 1969. He then went on to coach for the Milwaukee Brewers in 1972, and filled in as manager for two games when Dave Bristol was fired. He came back to the Mets organization and joined Yogi Berra’s coaching staff for the 1973 Pennant season. 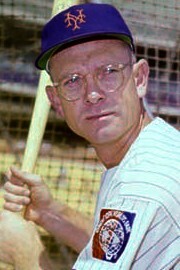 He stayed on board through 1975, and served as interim manager when Berra was fired in August 1975. 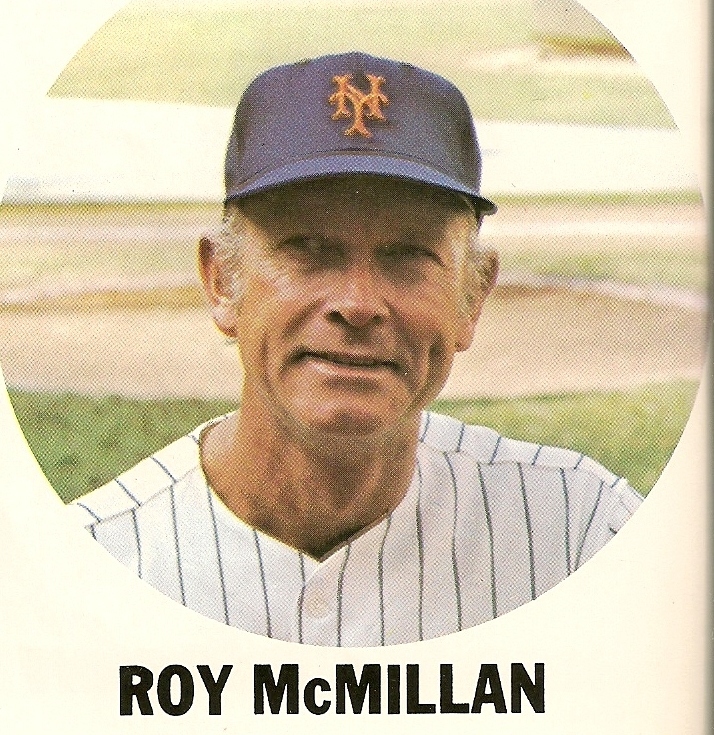 McMillan became the sixth manager in Mets history and enjoyed a six game winning streak as soon as he took over as manager. The players seem to respond to him quickly. But an 11-16 September ruined any playoff hopes the team had. McMillan went 26-27 in the last 53 games of the season, finishing up in third place. In 1976 he was replaced by former Mets minor league manager Joe Frazier, but stayed on board with the Mets coaching staff for one more season. He later became a scout for the Montreal Expos. McMillan was inducted into the Reds Hall of Fame in 1971. He passed away from a heart attack in 1997 at his home in Bonham, Texas, he was 68.